Collarette dahlias are one of my favorite flowers. So it's no surprise that I would want to make a scrunchie that resembles those beauties. 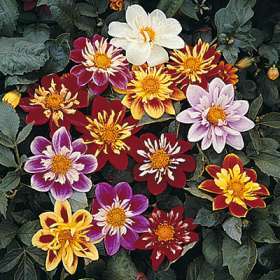 Dahlia Collarette description: One row of flat or slightly cupped petals surrounding a disc. These flowers have an inner set of petaloids generally multiple and irregular forming a collar around the disc. 2. For the first round If you want to use a longer elastic sc the number of stitches to half cover the elastic..
3. I used Red Heart Super Saver scraps. Round 2: Working behind round 1. Attach second color yarn, with a sc in the space between two sc of round 1. (Ch 8, slipstitch in the side of the sc just made) 2 times. *Ch 8, sc in space between the next 2 sc of round 1. (Ch 8, slipstitch in the side of the sc) 2 times. Repeat from * around. End with ch 8, fasten off and use your tapestry needle to join in the first sc of this round. That is a Clover Soft Touch hook. JoAnn and Michaels here both carry them. Good thing to use your coupons on. I think the regular price is $6.99.